Reliable and versatile communication is the essence of the Industrial Internet of Things (IIoT). Low Latency, high bandwidth, resilience, scalability, and standards compliance are key. Automation today spans more than forty protocols to meet the specific needs of numerous target applications. Nothing is better than Programmable Logic to give your product the flexibility to match all the networks of your customers. CC Link, EtherCAT, EtherNet/IP, EthernetPOWERLINK, Mechatrolink-III, Profinet, Sercos-III and many more protocols do their work in factories today. Time Sensitive Networking (TSN) is the newest step towards universal and deterministic communication and expands the possibilities for automation remarkably. Xilinx lets you keep up with evolving networking technology. Be among the first to support standards updates even in products that you already delivered. That saves the value of your developed assets and allows your customers to be armed for future IIoT applications. The seamless integration of networking protocols in Xilinx SoCs. Xilinx’s engineering and ecosystem provide a complete set of industrial networking solutions. Industry leaders like HMS Industrial Networks and specialists like SoC-e offer their field-proven IP on Xilinx devices. Extend your product lifetime with the long lifespan of Xilinx devices, often over 15 years and more. All relevant Industrial Ethernet Slaves – Profinet, EtherNet/IP, EtherCAT, Powerlink, and Modbus-TCP – are provided by Anybus IP from HMS. 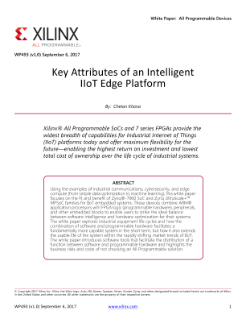 The integration of Ethernet Switches on Xilinx devices is simplifying the communication between heterogeneous systemsand applications. SoC-e’s IP is implemented over a non-blocking matrix infrastructure that is a robust base for networking in industrial and energy systems. The architecture can be combined with protocols like HSR, PRP, MRP, TSN and others. Controllers in automation like PLCs and PACs must contain a Master function for Industrial Networks. Embedded ARM Cores in Zynq SoC and MPSoC are ideal for running the master protocols. Data from the external network are forwarded to runtimes for Programmable Logic Controllers and Motion Control Kernels.